Palm yesterday introduced ten new applications to the official Palm App Catalog, the most notable being gDial Pro, an application that works with Google Voice. 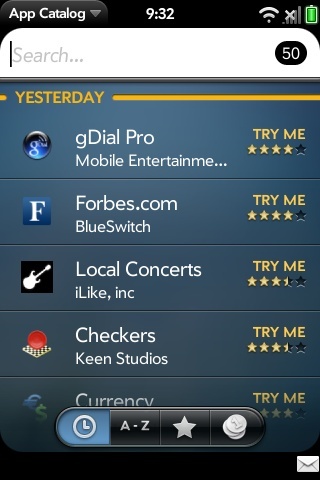 Google Voice apps for the iPhone were the subject of major controversy after they were removed from Apple’s App Store. The incident even prompted an inquiry from the FCC. In addition to gDial Pro, you’ve got eight other applications that are available as a free download direct from the App Catalog. AccuRadio: Offers hundreds of radio stations allowing you to stream from a selection of genres. Currency Converter: Provides conversion rates for popular international currencies. 420 Wallpaper: Brings you a selection of San Francisco poster art that allows you to utilize as wallpaper on your Pre. Forbes: Provides financial data and stock quotes. Video Poker: Ad supported game of poker that is sure to be a great time killer for poker fans. Checkers: The classic boardgame, on your webOS device. Lights Out: A puzzle game where the goal is to turn off all the lights. With these new apps, the total of Palm App Catalog apps stands at 67. We like the momentum and of course the new apps. Have a favorite? Let us know in the comments or in our Palm Pre and Pixi Forums.